Serves 8-10 portions ideal for lunches! Handful basil leaves, shredded, plus a few small ones left whole for scattering. 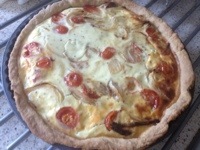 Option one – Make time for yourself on Sunday to create the quiche in one go then enjoy it when you like! Option Two – You can start this on the Saturday evening, complete it on the Sunday and then enjoy it for the whole working week. To start make your pastry: Tip the flour and butter into a bowl, then rub together with your fingertips until completely mixed and crumbly. Add 8 tbsp cold water, then bring everything together with your hands until just combined. (Option one) Roll into a ball and use straight away or (Option two) chill for up to 2 days. The pastry can also be frozen for up to a month. When you are ready to start the quiche creation, roll out the pastry on a lightly floured surface to a circle, about 5cm larger than a 25cm tin. Carefully lift your pastry it up, then drape over the tart case so there is an overhang of pastry on the sides, push the pastry into the corners of the tin. Chill in the fridge or freezer for 20 mins. Lightly prick the base of the tart with a fork, line the tart case with a large circle of greaseproof paper or foil, then fill with baking beans or rice. 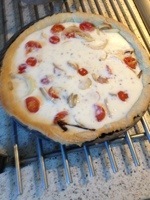 Blind-bake the tart for 20 mins, remove the paper and beans, then continue to cook for 5-10 mins until biscuit brown. While the tart is cooking, beat the eggs in a large bowl. Gradually add the cream, then stir in the basil and season.